It was another day of swings for the US equity market, and the VIX was naturally all over the place, with an early low of 21.44, but settling +12.2% @ 25.22. 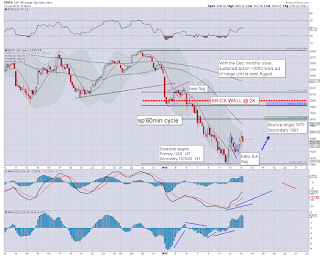 The daily candle was of the bullish engulfing type, and bodes for higher levels of volatility into the long weekend. It is highly notable that whilst the sp' hit 1901 on Monday - with VIX 27.39, despite the sp' @1886, the VIX only hit 26.11 today. In the scheme of things, this is only a minor divergence, but those equity bears holding short should be mindful of it. 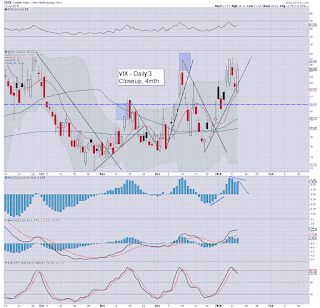 Despite a 3.2% downward swing in the sp'500 today, the VIX did not provide any hyper upside. In many respects, it is surprising that the VIX didn't explode into the 30s. 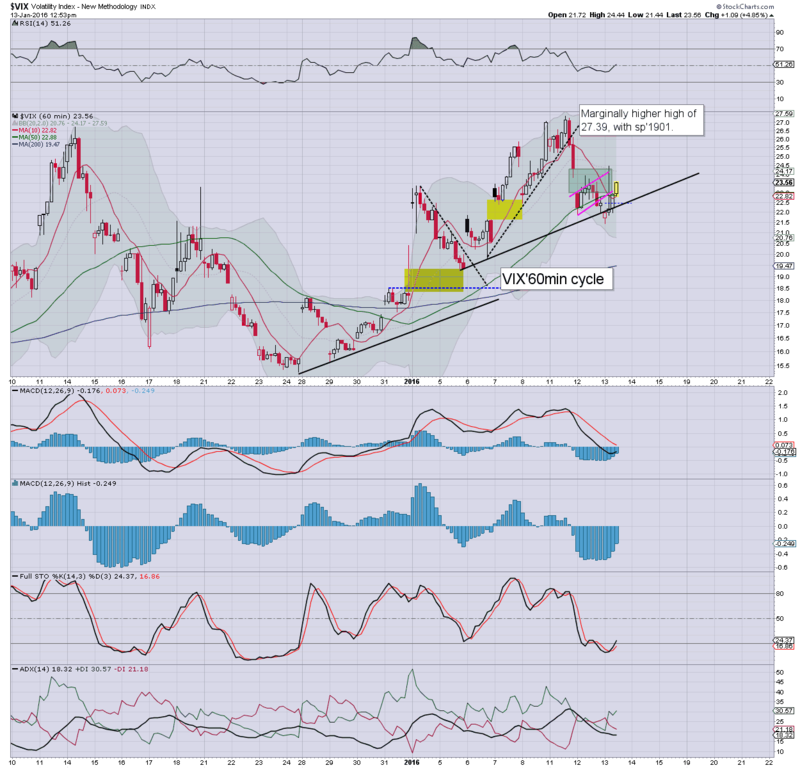 In any case.. whether or not the market can rally into the next FOMC of Jan'27th... VIX 30s and 40s look due in the coming weeks. Whether we'll see 50s.. or even 60s in the late spring/early summer difficult to say. It will largely depend on whether the market sees a gradual decline.. rather than a 'Sunday night surprise'.. - resulting in a giant gap lower - as we saw on Monday Aug'24th 2015. US equities opened moderately higher to an early peak of sp'1950, but then increasingly spiralled lower, settling -48pts @ 1890 (intra low @ 1886). The two leaders - Trans/R2K, settled lower by -3.7% and -3.3% respectively. With the failure of the 1900 threshold to hold, the door is open to the 1750/25 zone. I have adjusted the fib' retrace on the hourly chart.... but considering the GIANT bearish engulfing candle on the daily cycle... hopes of renewed upside are largely vapourised. I see ZERO reason to be on the long side, especially holding overnight/across the coming 3 day weekend, as there is HIGH risk of a giant gap lower. Worse case in the coming days.. the market implodes to the 1750/25 zone. .. and were that the case.. even I would then consider buying. In terms of a market short.. right now, 1960/80s are now 'best case'.... and were a turn to occur, that would likely drag out into FOMC week. US equities have seen a decisive failure to hold the Monday low of sp'1901, with a clear snap lower as a truck load of long-stops were triggered - new cycle low of 1886 and VIX 26.11. For now, VIX is still not showing any sign of hyper-upside. Unlike the past two days... the market has failed to rally, and the failure has resulted in a severe 3.2% swing from 1950 to 1886. Even if the market can attain a daily close >1900, the damage has been done, and technically speaking, the Aug' 2015 low of 1867 is now on the menu. Hopes of 1970s in the near term.... fading away. 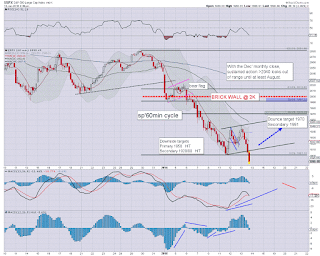 Seen on the daily chart.. today's reversal is a HUGE one, and bodes for further downside. 3.01pm.. So.. how low could we implode in the near term? Best case for the bears.. a brief spike down to the sp'1730s... aka. .like Jan' 2008. 3.17pm.. Its getting choppy again... and barring some kind of absolutely bizarre hyper-ramp into next week, the 1970s are out of range. Any hope of >2K seems ludicrous right now. 3.33pm... a clear mini short-stop cascade as sp'1900 briefly re-taken. 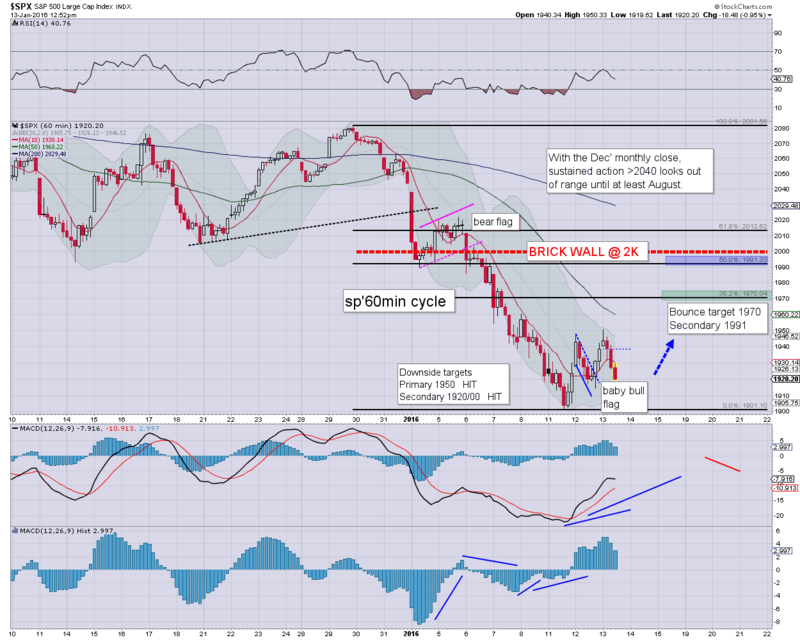 Regardless of the close.. a major failure for the bulls... as EVERY rally is being sold into. I realise many will now look for 1867 to hold... but 1750/25 zone IS a valid target within the near term. US equities continue to fall, with the Tuesday low of sp'1914 failing to hold. The Monday low of 1901 is critical to hold. 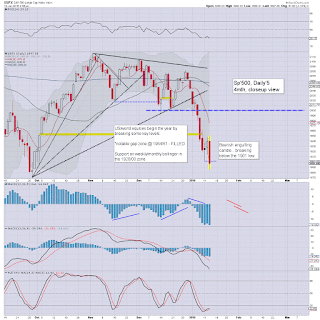 If 1900 fails, it changes the short term outlook, and would offer the 1860s before the weekend. If the latest Fed beige book fails to inspire, the trainwreck that began Dec'29th will resume. 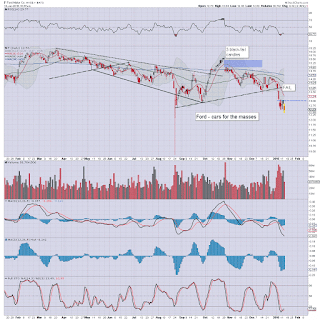 For now... best guess remains.. UPSIDE to 1970.. but that gets dropped if 1900 fails. VIX is offering a bigger bear flag... if sp'1900 holds... then sub 20s will still be hit. Count 2081-1901 as 1 .... with a 2 being Mon-Wed, maxing @ 1950? In any case, the ongoing underlying equity weakness is starting to spook the mainstream, as even the cheerleaders on clown finance TV noted how there is not any capitulation in the current down wave from late Dec'. 2.02pm. Beige book.... more 'weather' excuses... not inspiring. Well.. my best guess is that 1900 will hold... but hell.. we're damn close right now @ 1906. 2.04pm.. provisional sign of a turn from sp'1904.. to 1908. 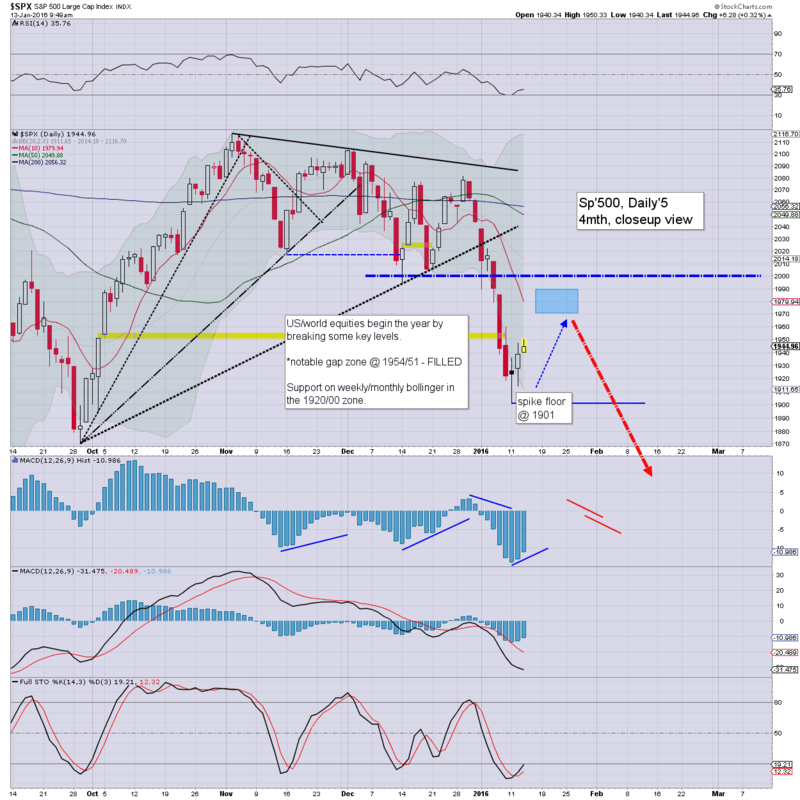 Equity bulls really need to claw back to the 1920s by the close to get out of the danger zone. 123 A... B down... 123 C Lousy idea.. or? 2.24pm.. 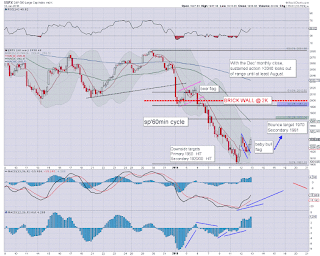 Fractional new cycle low.. 1900.74.. with initial 3pt bounce to 1903. That does support the notion that we'll rally into the close. 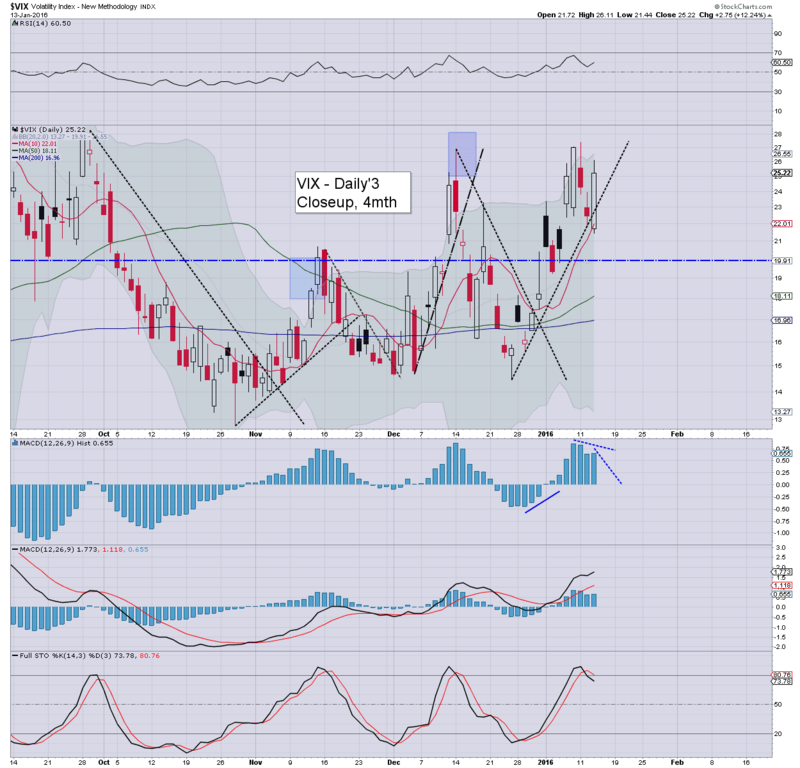 Its pretty clear.... as VIX cooling from 25.52. For the big money pros.. a simple long trade.. with a stop at 1900.00. Doesn't get any straight forward. ...2.33pm.. MAJOR fail..... sp'1896.... no support now until 1867. VIX re-surging to the 25s. 2.35pm.. The really kooky thing is that we're now 60pts (3%) below the morning high. 2.37pm... sp'1890 floor.. at the typical turn time? Urghh... in any case.. VERY nasty failure for the bull maniacs. US equities continue to cool, with the sp -19pts @ 1919. Equity bulls should get concerned on any break <1914, but that still seems unlikely. With a Fed Beige book at 2pm, there remains high threat of yet another latter day recovery, and right now.. that still seems far more probable than the 1901 low being broken this week. *an interesting movie trailer just caught my attention... it merits an entire post... but I'll save that for AH. So.. we're still sliding, but the smaller 5/15min cycles bode for an afternoon recovery. 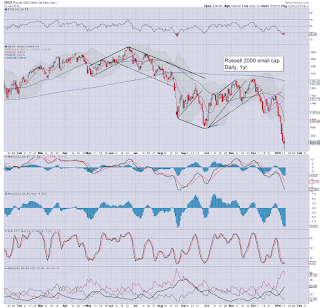 The daily MACD equity cycle remains so low, and from a bearish perspective, it looks like a lousy entry to attempt to chase lower. Despite another morning reversal from sp'1950 to 1929, US equities still look set for a third consecutive daily gain. 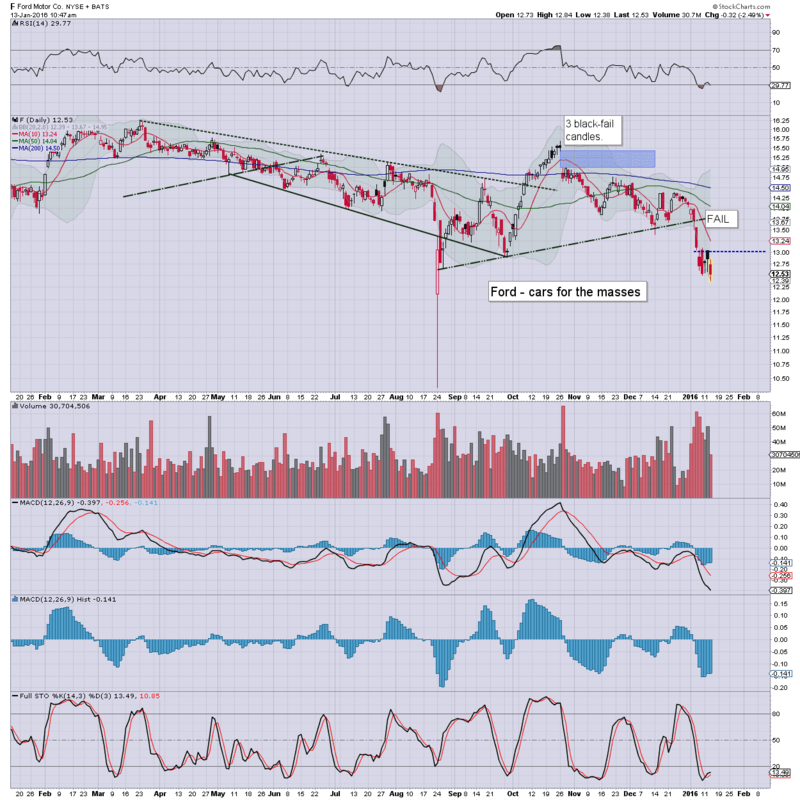 The 1970s remain a very reasonable target, and look on track within 2-3 days. The only issue is whether the bulls can somehow drag this out into FOMC week. ... and considering the recent price action, it is going to be very difficult for the market to hold together into FOMC week. Clearly, the fed aren't going to raise rates on Jan 27th... nor for the first half of 2016.. as equities are set for much lower levels. 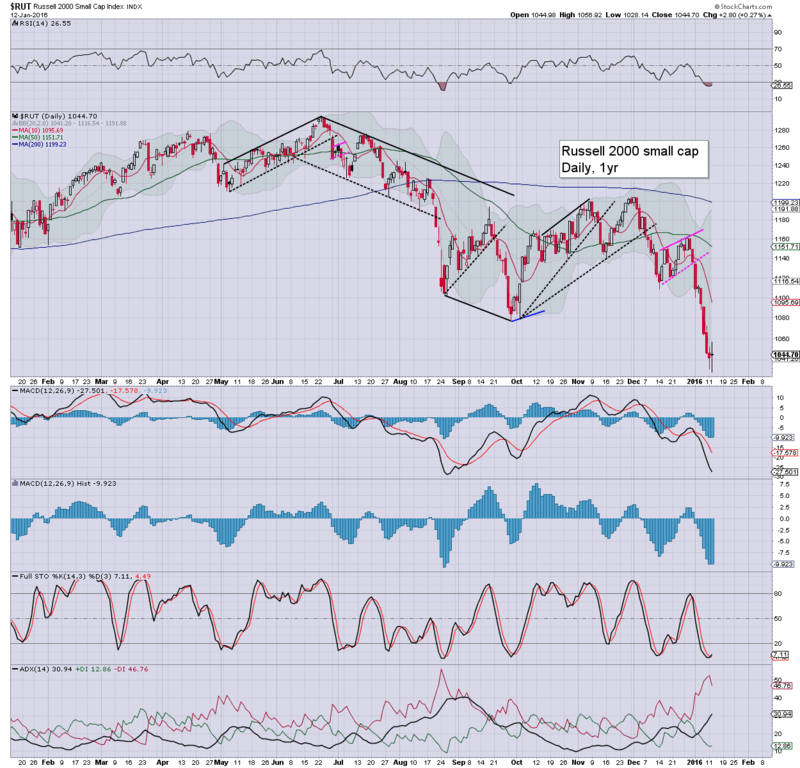 Without question, the broader market remains weak, not least pressured by Oil, which has seen yet another powerful bearish swing from +2% to -1.5%. Despite the morning weakness, equities still look on track to climb into Friday/Tuesday. The sp'1970s are not a bold target at all. Yet another day where opening gains quickly failed to hold. 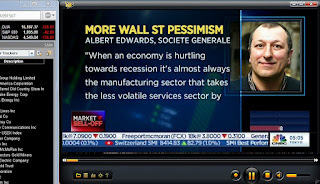 That is something we're increasingly seeing, its just a matter of time before the mainstream mood gets spooked. 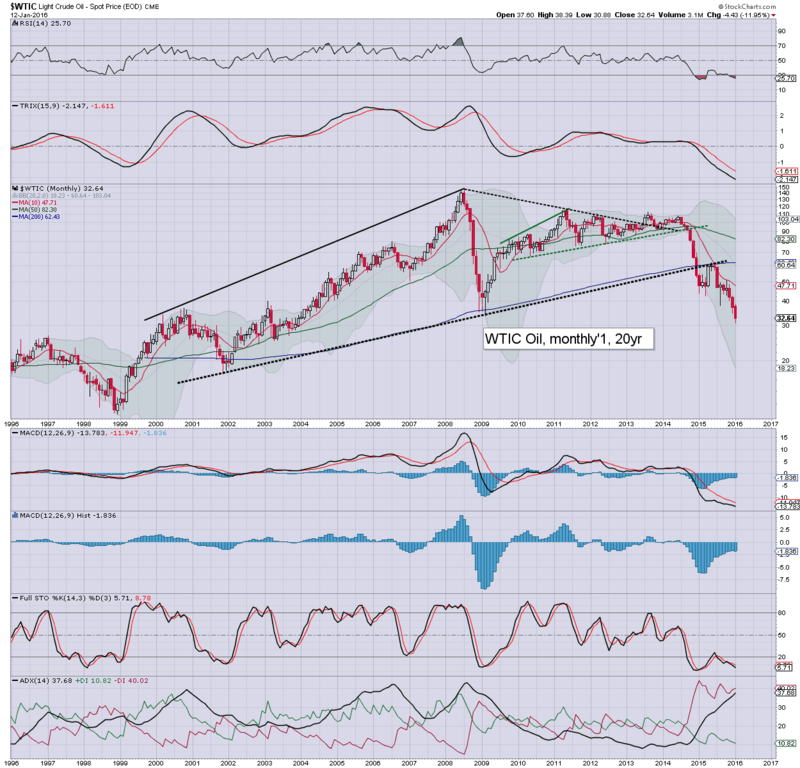 The opening declines to the year were significant, but there has absolutely been no capitulation in the near term. 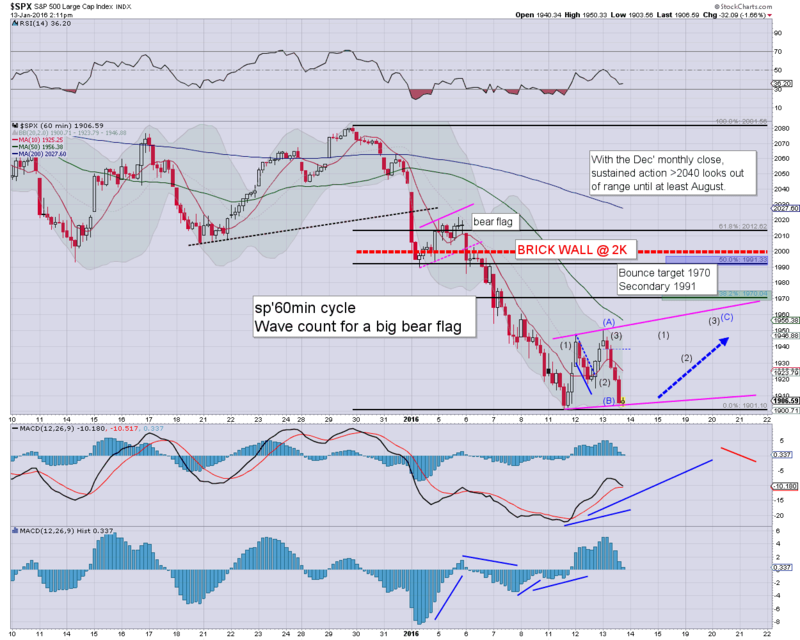 Frankly, its now one of the most bearish charts out there. You should be able to discern a slanted H/S formation. Note yesterday's black-fail candle... and we're spiralling lower. *the bigger monthly cycle is highly suggestive of $8.00 by the summer.... and that would almost certainly equate to the sp'1600/1500s. Its a rather nice sunset, if somewhat chilly. US equities open moderately higher, with the sp' breaking above the Tuesday high to 1950. 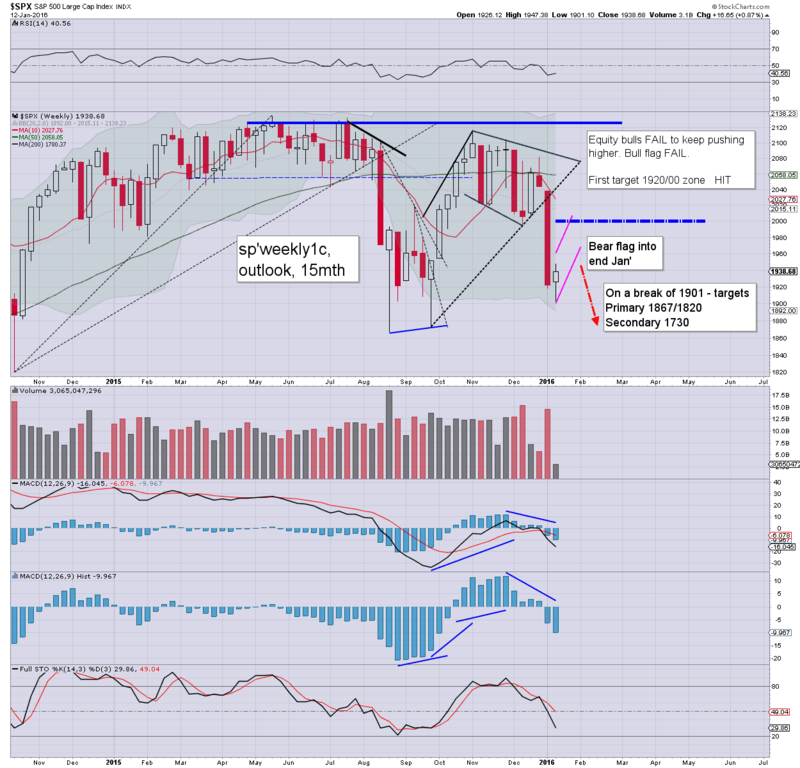 A third net daily gain looks probable, with the 1970s due by Friday/next Tuesday. VIX is naturally continuing to cool, -2% in the 21s, sub 20s look due. Oil is +1.7% ahead of the EIA report. *note the daily MACD (blue bar histogram) equity cycle... on any fair basis, we're set to tick upward for another 3-4 days (at minimum).. and that takes us into early next week. There seems zero reason for equity bears to be re-shorting ahead of the weekend. So.. we're higher, and yes the gains are again a little shaky. 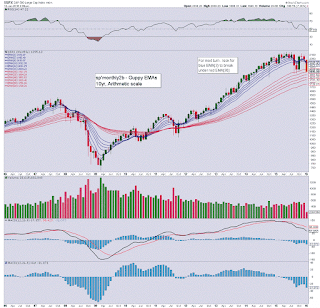 Certainly, market still looks tired, and this is clearly just a bounce. 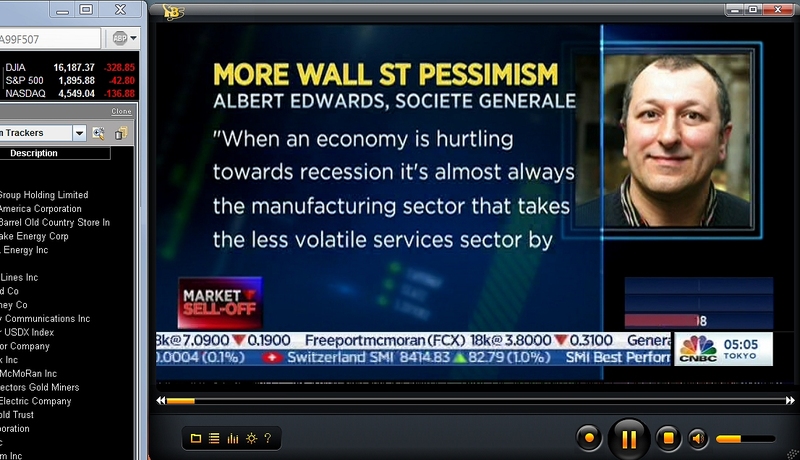 Even the cheerleaders on clown finance TV seem resigned that we ain't breaking new historic highs for many.... many months. time for a little sun.. and to shop... back soon! 10.31am.. Oil inventories: net build 230,000, minor.... but with giant increases in gasoline/distillates. Oil is naturally -1.6%... and that is dragging the market moderately negative. 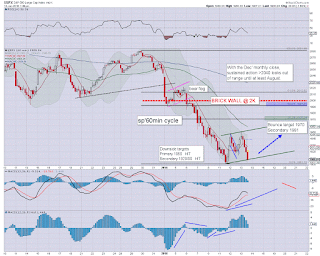 The sp'1901 low looks VERY secure though.... and I'm still guessing we close net higher... regardless of Oil. Good morning. US equity futures are moderately higher, sp +6pts, we're set to open at 1944. 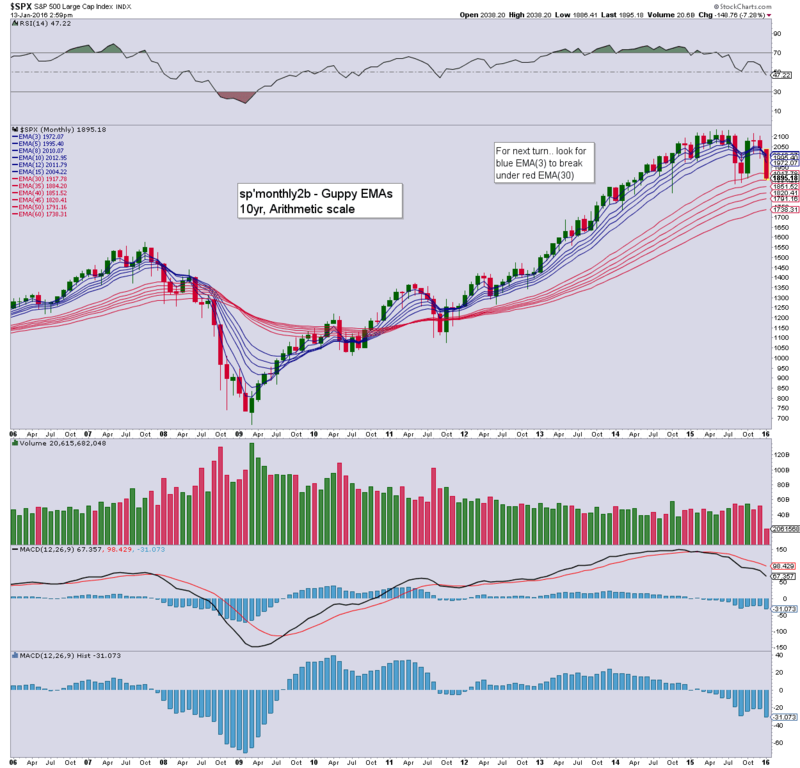 The 1950s look probable today, with the 1960/70s before the long weekend. With the USD +0.3% in the DXY 99.30s, metals are under pressure, Gold -$8. Oil is +0.6%. So, we're set to see some upside follow through from yesterday. Overnight China declines are clearly a problem, but if Oil can push a little higher today, then the market should hold together into early next week. To me, it is merely a case of whether we max out in the 1970s, or 1990s. Sustained action >2K looks out of range. TVIX -3.5% @ $7.60s... that is $4.20 below the Monday high. A horrific fall indeed, but it sure makes for a better buying level. TWTR +1.2% @ $19.85.... the mid/low teens look due by May/June. I realise Oscar annoys some of you, but still... a good oil call IS a good oil call. *I find it amusing Oscar, and so many out there don't like to say they 'predict' things. I'm highly inclined to go on a long rant about what is said in this latest gold bug promo, but suffice to say, its pretty bizarre viewing. Hoffman sure does throw a lot of deflationary talk around, and yet still holds to higher Gold/Silver prices. The fact he cites Mr Harvey (Gold could be 5K within 3 months) Organ, with a straight face... incredible! Then there is the the old 'cartel' argument, the same old crap gold bugs been touting for decades. After almost five years of declines, the Gold/Silver bugs are still in denial... they've learnt nothing, and yet at the same time, many of them still look at themselves as traders, or even economists. *yes, Hoffman looks like the reaper ain't far off, and frankly, it doesn't look like he'll live long enough to see Gold make it back to the 2011 high of $1923.70. I have long touted that one of the indirect signals for a Gold//Silver price floor will be some of the Gold bugs to 'disappear'... along with their websites. Capitulation IS coming in gold bug land. It won't be pretty... but its necessary. China, -2.4% @ 2949... unravelling into the close.... as 3K is closed under... and the 2500s are on their way. It was a day of swings for US equities, with an early high of sp'1947, but then rapidly cooling to 1914, and settling +15pts @ 1938. 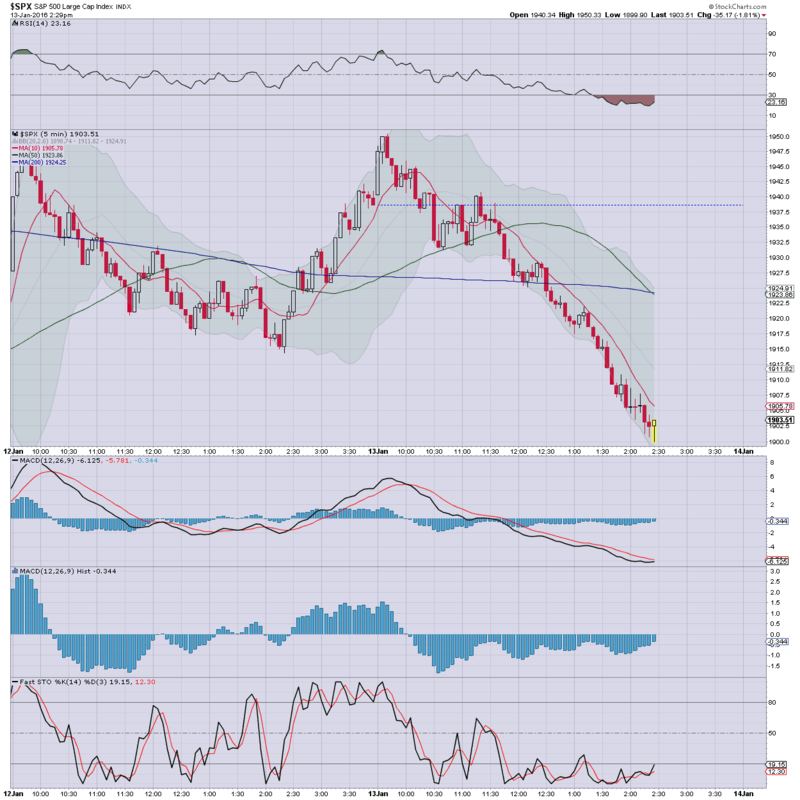 Near term offers further upside to the 1970/90 zone. 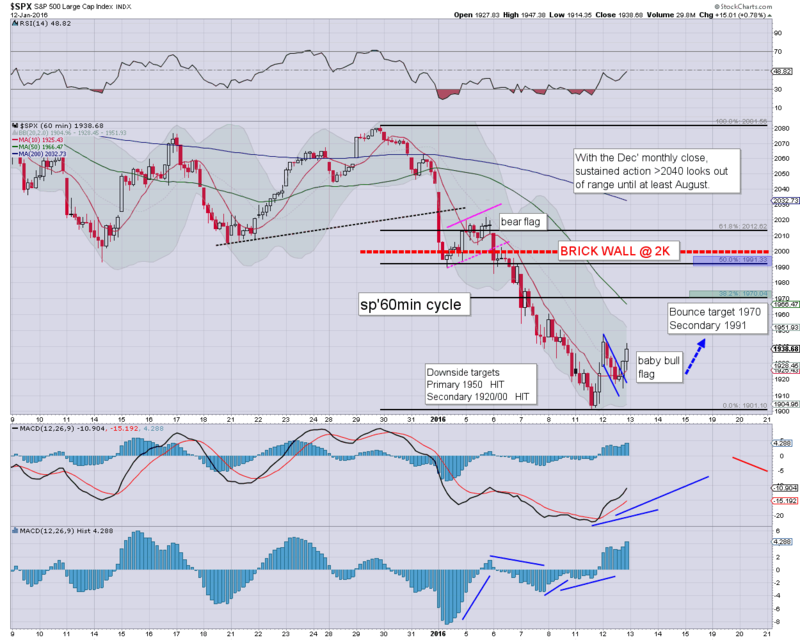 It should be clear to most though, sp'2000 is now a powerful brick wall of resistance. 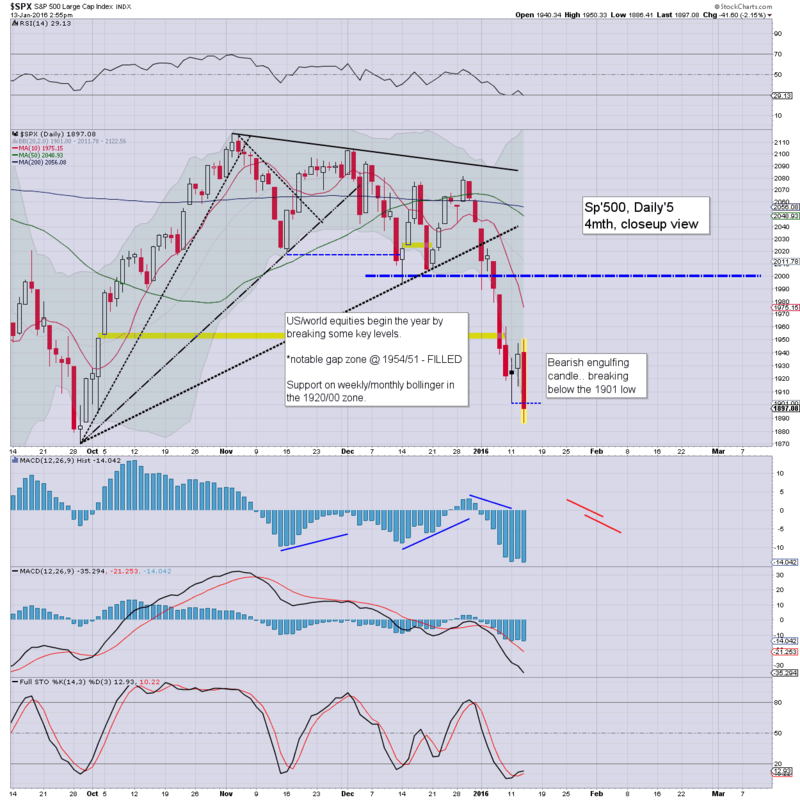 Suffice to add... market looks set for the sp'1970/90 zone, and that will probably drag into next week (keep in mind, the market is CLOSED next Monday). 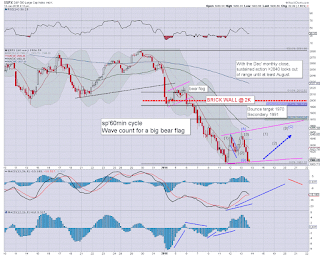 A 2-3 week bear flag is very possible, before the market resumes powerfully lower. 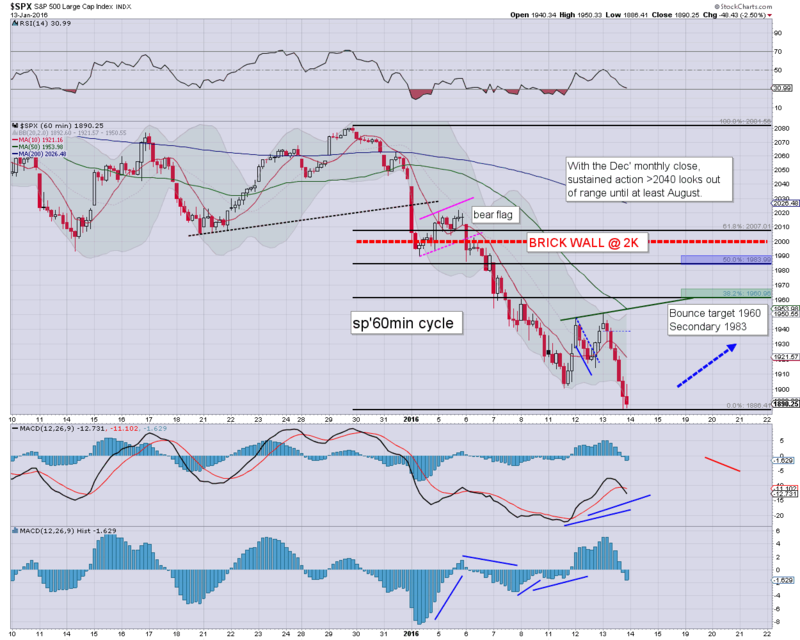 On no realistic outlook does sustained price action back above the psy' level of sp'2000 look possible. *stockcharts is not showing the Tuesday intra low of $29.93 for some reason. With the $30 threshold having failed, next support is around $25, back to levels last seen in 2003. Until supply is cut.. price will keep on falling. It is that simple. Wednesday will see the latest EIA oil report, Fed beige book (2pm), and the US Treasury budget. *Fed officials Rosengren and Evans are set to appear. US equities closed moderately higher, sp +15pts @ 1938 (intra range 1947/14). The two leaders - Trans/R2K, settled higher by 0.9% and 0.3% respectively. 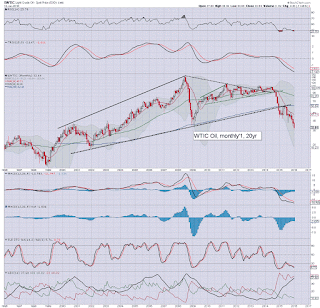 Near term outlook offers further upside to sp'1970... possibly 1990s.... before renewed (and in theory) more powerful downside to at least the 1860s. 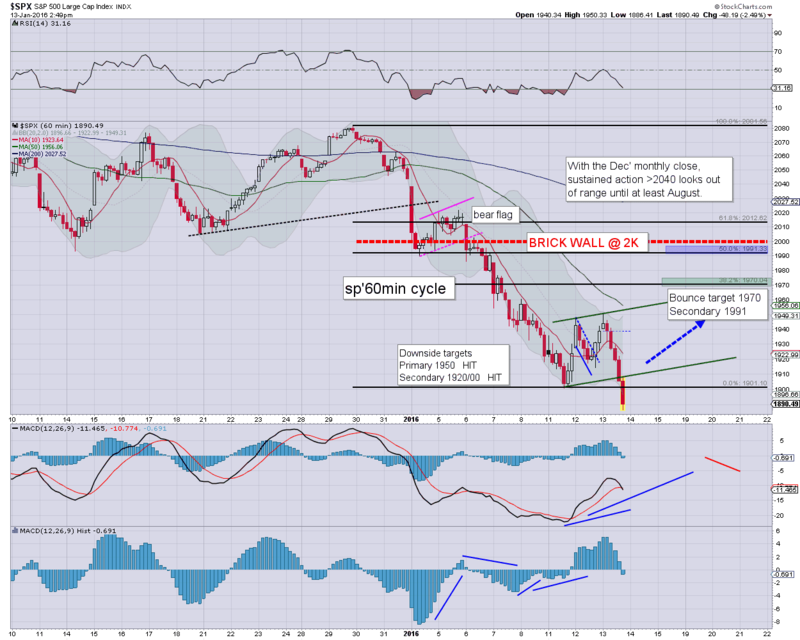 *R2K was notable today in that it briefly broke a fractional new cycle low of 1031. Next support remains the 1010/00 zone. 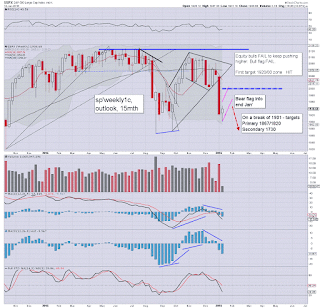 The sp'500 looks set to claw higher into opex-Friday/ early next week. 2000 remains an extremely powerful wall of resistance. Sustained price action >2K looks highly unlikely.